Through the years we have reached out into the community trying to help where we can, trying to give back to the citizens of Oshawa wherever we can. These types of outreaches have resulted in us undertaking many food drives for the Simcoe Settlement House, usually during their Christmas season. As well, we have in the past partnered with C.K.D.O. radio and the Auto Workers Credit Union with a Christmas toy drive for the Salvation Army. During the ice storm in 1998 we again offered our services picking up and delivering blankets, generators, and other emergency equipment to drop off points for delivery to our neighbours east of here. During the eastern seaboard power outages we volunteered to drive people to and from urgent medical appointments free of charge. We knew people would be stuck. No power, meant no access to cash for most people, we believe a person’s health was much more important than a few dollars on the meter. In the late 90’s we partnered with C.K.D.O. radio and in conjunction with Country Style Donuts at Simcoe and Taunton we took part in a Bury Terry Johnson in food event, all for the Salvation Army. This was an incredibly successful initiative – people who wanted to donate food but had no way to deliver their donation just had to give us a call, and we would pick it up and drop it off, free of charge. A large quantity of food was raised for the annual food drive and we were most happy to help out. Sadly on December 17, 2008 the Humane Society of Oshawa suffered a devastating fire and more than 150 animals were killed. As the Humane Society struggled to rebuild themselves a call went out to the community for donations of food, blankets, cash—whatever could be spared. City Wide Taxi heard the call and made our services available for the free pick-up and drop-off of any donation. Recently we ran a penny drive through our employees, the proceeds of which went to providing care packages for all the residents of the men’s hostel. We have participated in many Santa Claus parades over the years and we again were in last year’s parade, this is something that we plan on continuing well into the future. Prior to Remembrance Day, we contact the local legions and offer free rides for any and all veterans to and from the ceremonies. We feel that it is the very least we can do for those who sacrificed so much, so that we can live in the free and democratic country we call Canada, we are the only company in all of Durham Region who does this. 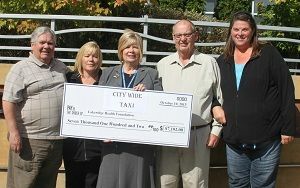 Last year City Wide Taxi held its very first charity golf tournament, the proceeds of which were donated to the Lakeridge Health Foundation for the R.S. McLaughlin Durham Region Cancer Center. The tournament was a very big success and we were able to give $7,102.00 to the foundation. In light of this success we have decided to make this an annual event and look forward to even greater donations in the future. On Saturday, April 19, 2014 City Wide Taxi was only too happy to help out the Easter Bunny and ensure that all the children in the Pediatric Ward received a gift for Easter. 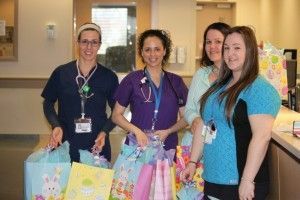 Leanne Hudson (3rd from left) of City Wide Taxi and three of the nurses from the pediatric ward deliver the gifts that the Easter Bunny left for the kids. Over the past 2 years we have ensured that in the Pediatric ward every single room has a flat screen TV so that the children have something to watch while they are recovering. 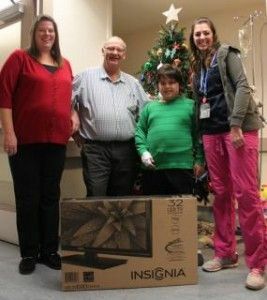 The critical care unit also received two flat screen TVs; one for the waiting room for families and one for the staff to be used for training purposes. All of this can only happen because of our customers. It’s people like you who allow us to give back to the community. You should be proud too! Every time you use our service, you’re also giving back to your community. So you see we at City Wide Taxi have a proud history here in Oshawa, a history born in giving back to the community, a history unlike any other taxi company in the entire area. We have a successful business that has weathered difficult economic times and still found the ability to give back. We have a proud tradition, and we are proud of our company.